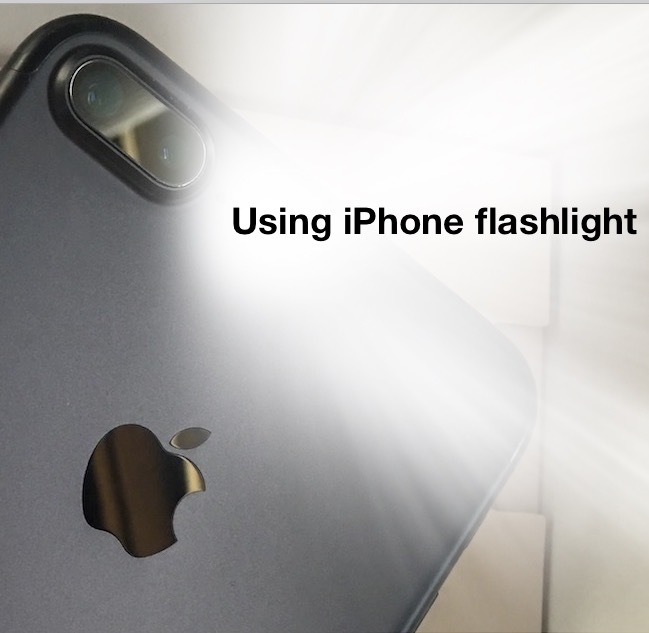 With the latest versions of iOS, your wonderfully useful iPhone flashlight can adjust the strength of its flashlight brightness, with three options of LED brightness intensity. This is really great to have the iPhone, as many dedicated LED flashlights have a similar ability to adjust the strength of the light, with a little switch to toggle between various levels of brightness shone from the flashlight. And now your iPhone does too! OK let’s back up a minute, I know what some of you are thinking; “my iPhone has a built-in flashlight?! ?” And yes, your iPhone has a flashlight. The iPhone flashlight works by continuously lighting up the camera flash on the back of the phone. Many people are aware of this already, but I’m always amazed at the number of people who do not know the iPhone has a built-in flashlight ability, even the heaviest of iPhone users. The feature is easily accessed from Control Center, as we’ll review in a moment. You can imagine the myriad of scenarios where using the iPhone flashlight are useful, whether it’s poking a key around a doorknob at night, looking for dropped keys in a parking lot, or so much more. It’s this flashlight feature that can now adjust the brightness intensity of. A quick note on compatibility; all iPhone models running any vaguely new iOS version has the flashlight feature, but the ability to adjust the flashlight brightness is a new feature that is limited to 3D Touch equipped iPhone models with the latest versions of iOS. Want to turn on the iPhone flashlight? It’s a piece of cake. First a quick refresher; you can access the iPhone Flashlight option from anywhere via Control Center. The flashlight works by lighting up the rear camera flash LED bulb, it will stay lit until the flashlight is disabled, or until the battery runs out. 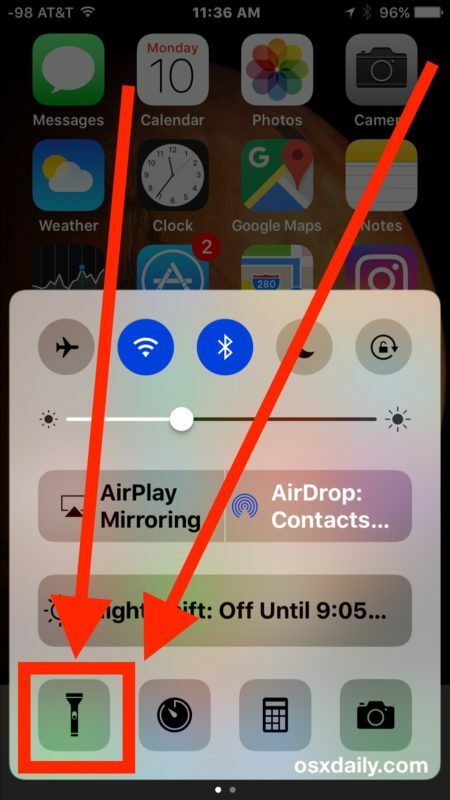 Remember, you turn on the iPhone flashlight just by swiping up from the bottom of the screen to access Control Center, then tap the Flashlight button. 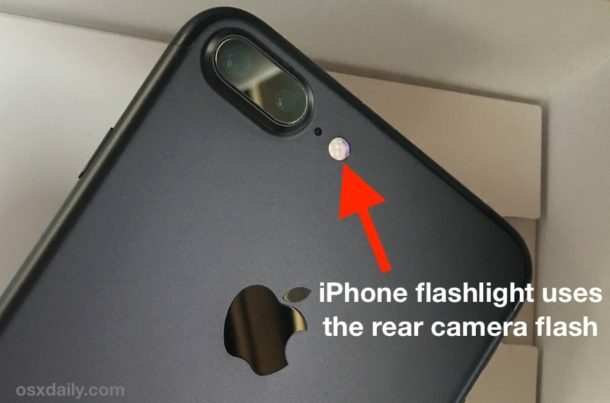 The iPhone flash light will instantly turn on. Using the iPhone flashlight is incredibly useful and impressively bright, but it will cause some drain on the battery, so use it as needed but you’re not going to want to leave it enabled for hours during a power outage or some other event if you don’t want to run down the battery. If you do want to use the iPhone flashlight for an extended period of time, that’s where the light adjustment feature gets particularly valuable, since choosing a lower brightness level will result in less battery usage. If you’re amazed by this (rightly so, it’s fantastic), you’ll likely appreciate this as a trio of features which make the iPhone into an unexpected multi-tool of sorts. 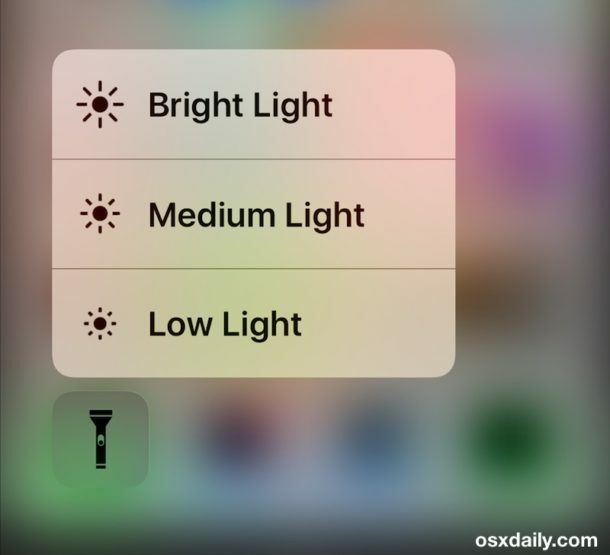 Adjusting the iPhone Flashlight brightness intensity requires an iPhone with a modern iOS release of 10.0 or later and 3D Touch capabilities, meaning a 6s, 7, or better. You can adjust the intensity of the flashlight brightness either before or after the flashlight itself is turned on, all you have to do is 3D Touch the flashlight button in Control Center at any time to access and choose the desired brightness level. For quick uses I always maintain the “Bright Light” setting, but for a situation where you’re going to be using the iPhone flashlight for an extended period of time, choosing a lower brightness setting is probably a good idea since it uses less energy and therefore less battery. The Low Light setting is also nice if you’re using the flashlight as a bed-side reading light, since it’s not nearly as intense as the Bright Light or Medium Light setting. Try them all out and you’ll learn to appreciate each one. Enjoy using your iPhone flashlight, whatever the brightness setting may be! Flashlight is a great feature that I am also surprised so many people do not know about. I still continuously see people using the front screen of the iPhone as a flashlight, the old way like some of the very old apps used to work, some of it is probably habit, but a lot of it is just unawareness. I’ve also noticed that some of the big bulky cases that have protective covers can refract the light a bit, especially the transparent ones. Any good dedicated case shouldn’t do this though, none of the Apple cases or Speck cases do that I have. I use the front screen with one of those old flashlight apps (the Apps from Outer Space version) on occasion as it’s a much softer light, and fully dimmable, which is handy for some occasions. And for those like me who don’t have a newer phone that we can dim using the method in this article, this can be very handy! I like this iPhone flashlight features. But, it has not various mode. Like low, medium, high etc. Those features only have the normal flashlight. This tip will come in handy when I use the flashlight to read a menu in a restaurant. It will be nice to set the setting to low & not blind my dinner companions! The control center tool no longer swipes up from the bottom of my phone now the newest update has been installed on my phone. I no longer can access my very used feature and would like to know how to access it again. I was so desperate to know how, I even asked Siri to open, use, and access it. None of which she could do, how was this update helpful or useful??? If it’s the music app that comes up, try swiping left to right on it. How do u 3D Touch it? I thought you just pressed on the flashlight icon but that still doesn’t help me -?it goes blurred – maybe I’m not pressing it long enough. Will it also work on camera light settings too? Simetimes the camera light is little too hash dint yall agree too?